Product #6417 | SKU DVIPLUS* | 0.0 (no ratings yet) Thanks for your rating! The Matrox DVI Plus HD-SDI Scan Converter allows broadcasters to embed the stereo audio input into the SDI output signal. 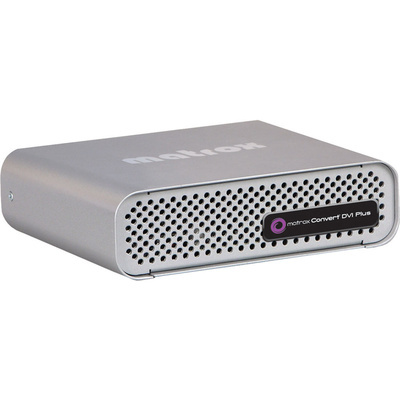 It provides a progressive DVI-D input up to 1920x1200, and offers simultaneous analog/digital video output. Realtime upscaling and downscaling is possible with proper color space and aspect ratio conversion. SD analog black burst (bi-level) or HD trilevel genlock is available with timing offset controls. The DVI Plus HD-SDI Scan Converter offers region-of-interest support with flexible scaling, positioning, and panning with realtime output update. Background color can be selected, such as super black and super white for downstream keying applications. It also has Proc Amp controls, and consists of features such as anti-flicker filter, customizable presets, password protection, and SD pixel aspect ratio compensation. The DVI Plus HD-SDI Scan Converter has a hotkey-triggered output signal freeze/unfreeze. It can operate as a stand-alone device independent of a PC to deliver SDI and analog video.